“I have noticed a resurgence of Blacks buying Black around the country,” said Rashad Byrdsong, executive director of Community Empowerment Association. “Because we have been excluded from the system for so long, it seems like people are now realizing that it is necessary to keep our money within our communities.” CEA has been focused on its mission of creating spaces of empowerment, education, and fellowship that reconstruct and fortify the cultural foundation of the Black family. Additionally, by consistently generating jobs and economic sustainability, CEA serves as an institutional foundation for the strengthening of Black communities. VENDING WITH A PURPOSE—Homewood resident and Savannah College of Art and Design student Alexis Coleman, vending during the Homewood Small Business Expo. “Have a belief in yourself that is bigger than anyone else’s disbelief,” Coleman said. Ralph P. Watson of Classic Events feels that businesses and organizations should work together, as well. “I’d like to see one big Small Business Saturday Expo in the Black community next year so venders don’t feel they are spread too thin and have to have an allegiance to one organization,” he said. Known for his phrase, “Increasing your network…increases your net worth,” Watson serves as an advocate for small business development and provides a platform for entrepreneurs and organizations to gain access and exposure to a variety of decision-makers and civic leaders. His Holiday Vendor Showcase event held at the Hosanna House, Nov. 25, provided exposure to over 25 vendors selling a variety of items. State Rep. Ed Ganey played the role of Santa Claus and distributed raffle items to patrons. The next Classic Events affair, according to Watson is the Black History Celebration Dinner at the Hosanna House, Feb. 24, 2018. With the goal to expand the platform that the Homewood-Brushton Business Association has created for the business community and to showcase quality small businesses, the organization recently hosted its second annual Homewood Small Business Expo. The morning sessions were designed for business owners to receive quality information and education. Two different tracts offered information for start-ups and existing businesses and consisted of a professional panel discussion moderated by Allegra Johnson, creator and host of CitySTYLES412, to help entrepreneurs take action to further their growth. Panelists included Mamar Gelaye, the former CEO of Omnyx, Chris Edmonds of Athletic Trauma Unit, and Shallegra Moye, founder and executive director of Brilliantly Blessed Community Health and Wellness. Speakers included Attorney Dana Richardson; Diamonte Walker, Minority and Women Business Enterprise Program Officer of the Urban Redevelopment Authority of Pittsburgh; Emily Keebler, Kiva Pittsburgh Program Director; and Jonathan E. Gamble, owner of AXNFGR. Participating venders in the afternoon activities, according to Vernard Alexander, provided an opportunity for area residents to learn about the businesses in their own neighborhood and provided the opportunity for those businesses to attract new consumers. 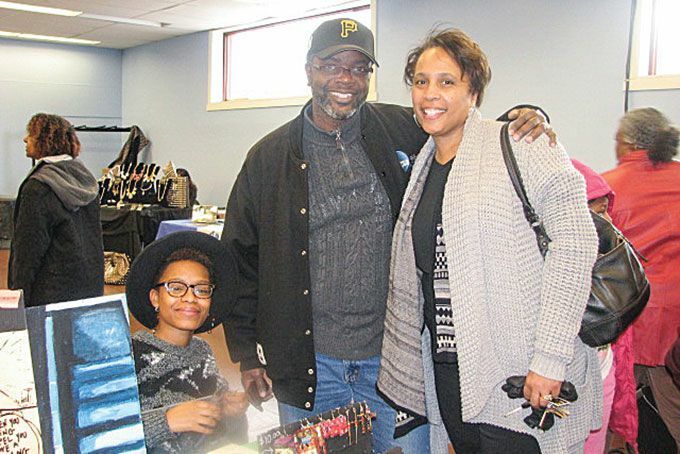 Purposed to encourage aspiring authors to write their first book, learn the business of writing a book and provide local authors a platform to showcase their talents while connecting with the Greater Pittsburgh community, organizers of the Write on First Annual Black Book Expo considered the event a success. Founded by Robyn Greer, Sharise Nance and Bonita Penn, all published authors, the goals of the Expo were to bring books, authors and the publishing world to the reading public. They said the event showcased books from all genres and offered authors opportunities to promote their books to readers most likely to engage with them. Darcla Reed and Tara Bailey from Bailey Publishing House were keynote speakers.